Serious Sam explodes into the second dimension using everything in his arsenal to battle the abominable legions of Mental’s horde. 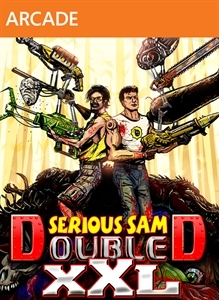 Let the heavy ordinance fly in this hand drawn, side-scrolling shooter featuring the all the over-the-top gameplay and chaotic action of the Serious Sam series. All that stands between victory and annihilation is a man in a T-shirt and jeans wielding a great big pile of guns. Serious Action – Lay down a wall of bullets and flame as wave after wave of bizarre and ferocious creatures unleash a punishing assault on Serious Sam. Guide the iconic hero across three sensational worlds from the pyramids of ancient Egypt and Pompeii to the harsh jungles of the Jurassic period. Boom, dinosaurs. Revolutionary Gunstacker – Serious Sam’s new gunstackers allow you to stack any combination of weapons one on top another and fire them all at once. Two shotguns on a laser gun and grenade launcher? Of course. Four chainsaws and a flamethrower? Yes, please. Unique New Enemies – New ferocious recruits like the Femikaze and Chimputee bring an all new explosiveness to Mental’s horde and will challenge Sam like never before. Challenge Rooms – Throw down the gauntlet and take on wave after wave of ruthless creatures for maximum chaos.